Is it any wonder that the old tale flashed back to my mind? Like little Lilliputians, they curiously circled Gulliver lying prone on the ground. "They were fiercely protective of their kingdom...but overall they were hospitable." "Eventually Gulliver becomes a national resource..."
Wow - I've never been first to comment (you with so many followers! )...I love the whole series! I'm jealous! I must come to this place some day! And you can come see my pelicans! ...and *that* was the joke! I see a series brewing..."Squirrels Reenact The Classics". Love Brad's comment! That's a wonderful slideshow - I've played it three times. Love the circling, love the pairs...whole thing very amusing and agree that today's picture had to be the one you selected. How amazing. Thank you Louise for waking me up with a smile!!! Looks like you had a really fun time playing Lilliput with your little friends ; D nice close up too really captures squirrel's curiousity & movement. You are going to have so much fun with little peanut! Do you get Squirrels in your garden? A friend of mine once "trained" them to go inside his apartment by Regent's Park!!! These are so great (yes, I played the slideshow, too), and so fascinating to look at! 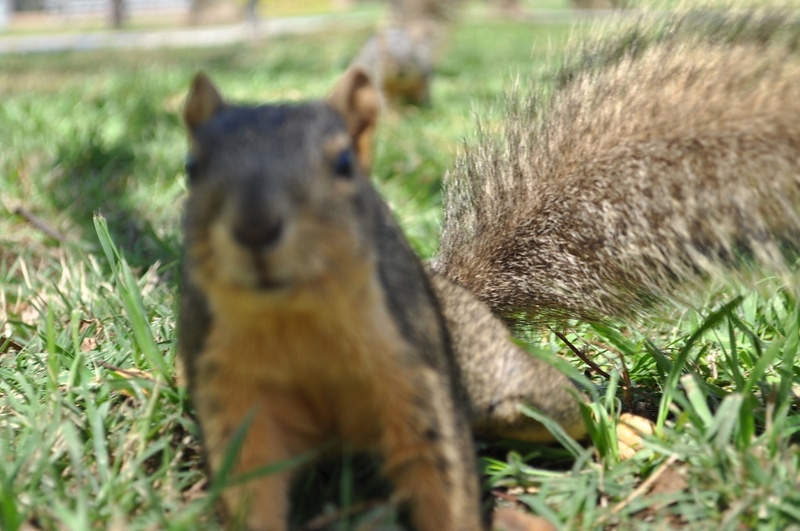 I've never really thought of squirrels as particularly social, but these little guys show a lot of personality! Roaring my head off with laughter Louise. Bless you!! Yes, it must be bedtime for you. Sweet dreams! I saw my first neighbourhood squirrel of the season today...a black one...though he didn't come into my yard, he jumped the fence and scampered down the back path. If I;d had some peanuts... I might have been able to lure him,, but alas, I am allergic to peanuts, and Brad hasn't bought himself any, for a while. And, Gulliver's Travels was one of my favourite books, when I was a kid! Oh yes he does look curious. Hi, yes that's right, Helen is my sister! She got Mum onto this project and Mum then told me about it, so it's turning into a nice way to communicate as we all live miles away from each other! Am really enjoying it, and had to laugh at this photo as I have a thing about squirrels, love them! I love this photo and the entire slideshow. All of the pictures were so much fun to look at! Thanks for sharing your adventure with us! Maybe someday you can also share with us how we can become 'squirrel charmers' too! Loved all the pictures in your slideshow. It must have been very difficult to choose. My favorite is the one with the pair approaching. I love their seemingly coordinated advance. Oh, Louise, I loved the slideshow! I totally understand why you chose this shot, but I think my favorite was the one of the squirrel between Ken's feet ... What fun the two of you have! On another note, it's a winter wonderland outside - at least 8"-10" of snow on the ground! My poor daffodils and tulips! But, no snow picture today ... Nique and I are off to Denver (a four hour drive for u) for a dance competition. Don't know if I'll be able to post before Monday. Have a lovely weekend! As many times as I see you great pics of your little furry friends I cannot get over how friendly they are. It boggles my mind to see anyone get that close to a squirrel. great stuff! the fearless ones were my favorite. and may i applaud you for taking time to have fun in your life, good on you! This is hysterical! I love the look on his face! All squirrels look like they are constantly surprised. It looks like they are saying "What the..?" (Can't really spell that to make it sound the way I mean it!) The slideshow was awesome! I love how two squirrels can conspire to steal away the goodies. And you are brave to get on their level--I am glad Ken was there to avert any direct attack! I loved Gulliver's Travels while I was growing up, the movie not the book. I haven't read the book yet. Great shot, and reference to Gulliver... just be careful if you see them heading toward you with balls of twine...! I hope your friends in New Scotland give you more latitude to persue your photo gifts than you are expecting--if I have to go three months without classics like your slide show, I think I'll develop the DTs!! oh my gosh, this is too funny! I loved the photos up on shutterfly - what a great "photo" story! I have now affectionately named all my squirrels: LL's friends. Louise and Lauren. You two should start some advocacy group together...or a cartoon series...or even a children's book! What a great close up! I know your little clan looks forward to your walks everyday...and the peanuts! They are going to miss you this summer! Another squirrel?? No way!!!!! Hahahaaha... too cute!! oh my louise...i think you've lost it! Finally we get to see a squirrel from Louise. :-) How many are there that are willing to come close to you? Can you tell them apart? Have you named any? Love squirrels! They have so much personality. what a beauty! thanks for the ref to another beautiful squirrel shot! no louise i looked at your album, and was picturing you on the ground photographing squirrels. this is pretty amazing :P I love the look on that cheeky little face, fantastic capture! ohhh i see! thats cute! i have never heard of that story before but i really want to read it now. and i just want to thank you for always commenting on my photos. you make me feel important and loved and i am very greatful!! Very funny, love the series on shutterfly and the story. Made me smile. Hi....haven't worked out how to set up the Shutterfly thing properly - did it in a daze this morning. A dear, dear friend who was in my year in college (for ministry training) died suddenly this morning. He was married three days ago. We are all in the blank shock that drains the blood from your body and the thoughts from your mind. Dreadful loss to his wife, their families, his churches and to the whole Church of Ireland. He was one of the most talented, funny, adorable, eccentric, beautiful Parish Priests you could have ever known. His friends will miss his dreadfully....his poor widow..... The next few days may be a bit of a blurr. Will try to post on 365. Will blog and have just completed today's. Am so sad and still can't believe that I'm going to his funeral on Monday 26th in the church in which he was married on Tuesday 20th. In the marriage register one week. In the deaths register the following week. If other visitors to this site read this....you'll understand if I don't make many comments on pictures over the next few days.....we'll see how time goes.....and I'll get Shutterfly sorted eventually...but not this weekend I think. Sorry to be pouring out all this bad news...but this community feels "safe" and I know you'll remember us in Ireland over these next few days. what a cute series. love all those shots louise, and the ones of your hubby playing with them in the road is funny. elizabeth... what a sad story, i'm thinking of you. I need to pop over to Elizabeth's page to offer my condolences but first I have to say that your squirrel saga just keeps getting more entertaining. It does have children''s story written all over it. This is so cute Louise, what a cutie! Too funny! You are a hoot! Lovely squirrelpictures! I like the 'circling' one and the one you chose.